I just love how they lock into a style. I only used a loose scrunched and about 4 hair pins for each out these styles. I completed all of them in about fifteen minutes. That’s right, nine freestyles in about fifteen minutes. My sister grew tired of daily maintenance of her natural hair so she decided to go for a protective style. 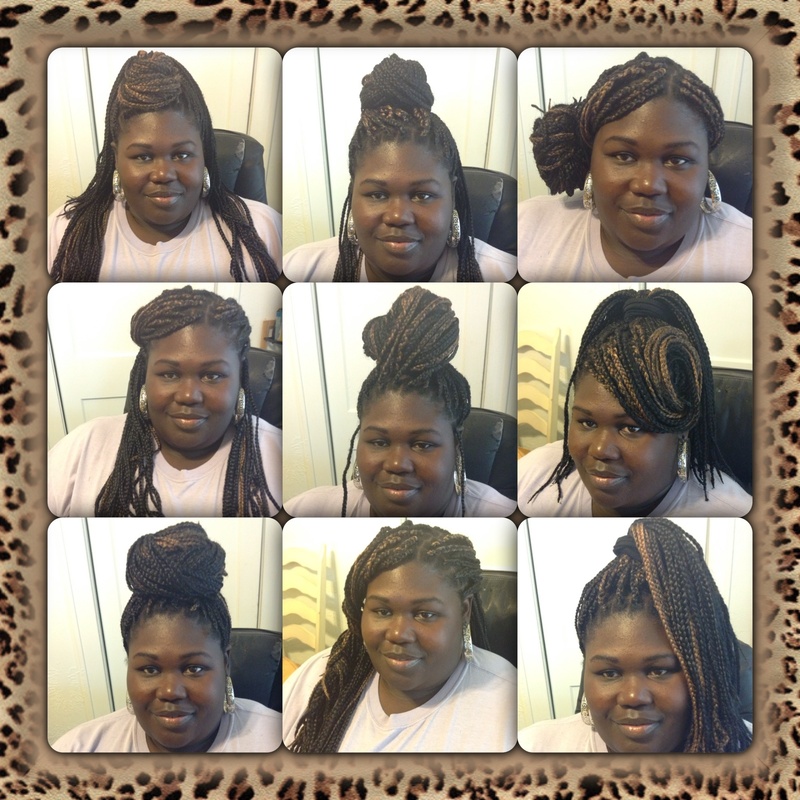 Her first choice was box braids and they turned out great! And not to mention the versatility! But a week into the protective journey she phones me and says, “What can I do with these?” The real question is what can’t you do. You can’t get bored with these!!! I love em, love em, love em! Well I haven’t experienced them personally but seeing the simplicity when styling my sis’s definitely make them a must have/experience for the summer. I think i’ll be getting some very soon or something similar. Once you’ve styled for about three weeks to a month and a half depending on the amount of product you use on your scalp and on the braids you will have to wash your hair. Beating at your head and sticking rattail combs within those braids only work for so long, so here is our washing procedure. 2.) Spray the mix directly onto you scalp. This means you’ll have to maneuver through those thick braids. 3.) Use your fingers to lather and remove caked up grease, flakes, oil, etc. 4.) This is where the extending shower head comes in. Use the head to rinse the shampoo out of your head and down the long braids. However, if your shower head is stationary, filling a cup with water works just as well. 5.) Repeat steps 1-4 with conditioner. 6.) Once you’re complete, your head will feel like a ton of bricks. Get your towel and dry your hair from root to end. (Repeat step 6 till hair is no longer dripping and as dry and you can get it. 7.) Wipe your forehead and congratulate your self! 8.) Right about now you scalp probably looks exceedingly dry. Grease your scalp with YOUR essential oil/cream to give your scalp some nutrients. And that’s it. You’re probably still a bit damp, but you’re ready for more styles ladies!